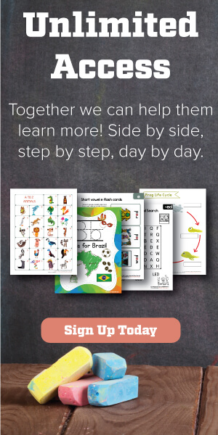 With our collection of alphabet worksheets, children will practice early literacy skills. Learn to recognize, read, and write all letters of the alphabet, from A to Z. Find a fun way to learn and engage your students! Writing the alphabet does not need to be taught in sequential order; group together letters that use similar pathways, such as ‘a,’ ‘c,’ and ‘o;’ be aware of visually similar letters that children may confuse such as ‘b’ and ‘d’ or ‘p’ and ‘q’. Teach students phrases to help them remember how to form letters (e.g., “down, up, down, up” to make ‘w’). Use different modalities to teach children how to print letters, such as salt trays, whiteboards, and apps. Read books and sing songs about the alphabet and provide students with alphabet puzzles. Teach sounds in the context of guided reading and writing activities and by anchoring sounds to objects such as ‘ssss’ for “snake”. Teaching the alphabet includes recognizing the letters, naming them, printing them, and learning their sounds. Students need to learn both the uppercase and lowercase letters; educators typically begin with lowercase letters when introducing how to print them. Acquisition of letter sounds is a precursor to early reading skills; students can use beginning sounds to predict words and later, use their knowledge of sounds to stretch out small words. Students should recognize all uppercase and lowercase letters and their sounds during kindergarten or first grade.